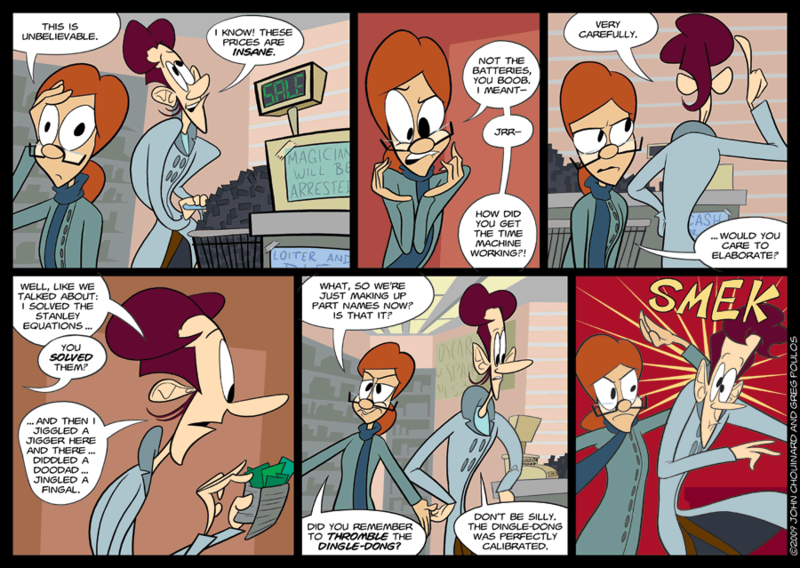 Comic for Jan­u­ary 2, 2009: Smek! Milo has a his­tory of giving incred­i­bly unhelp­ful answers. And—hey!—gotta love those Stan­ley equa­tions! He forgot the thingy­ma­wooger and the whatch­macal­lits. I used to wonder what a ‘gooey’ on a com­puter was. Some­times tech­ni­cal terms just sound…silly. I know that it’s a Graph­i­cal User Inter­face now, but I still think Visual User Inter­face would stop people from going ‘lolwut’ when they hear some­one talk­ing about their GUI. this is awe­some so far. nice to see a nerdy web­comic that doesn’t con­stantly make jokes about pro­gram­ming! @ Dar­ti­gen: Oh man, I like “thingymawooger”. I might have to steal that for use in every­day con­ver­sa­tion, if you don’t mind. But yeah, I know what you mean. I sorta sus­pect that people keep using some of these terms because they sound goofy. Another exam­ple: WYSI­WYG, or “wizzy-wig”, for What You See Is What You Get. @ Martin: Thanks! But I guess this means John and I might want to re-​think our big 25-strip sto­ry­line about Jen’s ZANY attempt to imple­ment a Fibonacci heap in C. Oh, SEG­FAULTs: you’re so wacky! I noticed the copy­right 2009. Happy New Year! John is on top of things! I’d prob­a­bly have missed that detail if I were in charge of the drawin’. Happy new year to you, too, Brad! And to all of our read­ers! Huzzah! I an con­tin­u­ally awe-​struck by the bouyancy(sp? that looks wrong) of Milo’s hair.